Pictured is B&M Bargains, at Ravenside Retail Park, Chesterfield. 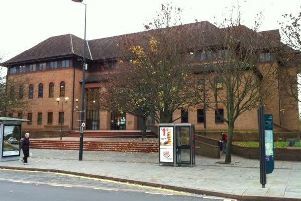 A desperate thief has been ordered to pay £195 in fines and costs after she struck at a Chesterfield store. Chesterfield magistrates’ court heard on Tuesday, November 15, how Charlene Louise Turner, 28, of Cauldon Drive, Holme Hall, Chesterfield, stole goods worth £39 from B&M Bargains, at Ravenside Retail Park. Prosecuting solicitor Neil Hollett said Turner was seen placing items including aftershave in a basket but the store became suspicious when she left because the basket was empty. Mr Hollett added that the goods were recovered but Turner had intended to sell them on to help pay for gas and electricity at her flat. Turner pleaded guilty to the theft and she apologised for her actions after the incident on October 28. Magistrates fined Turner £80 and ordered her to pay a £30 victim surcharge and £85 costs.